My son is not a kid with idle hands. From sunup to sundown, TJ puts the pedal to the metal the moment he jumps out of bed. I’m one of those weary mommies whose child loses his naps by his second birthday. Parents have advised me to institute “Quiet Time” in lieu of a nap. After a few bangs on the door and some loud crashes resulting from acrobatic attempts from the bed to the floor, I give up. Thankfully, there are a few special items I can wave in front of TJ, that arrests him to a screeching halt: books, TV and puzzles. Books are usually consumed throughout the day, for the times I can’t play another round of crashing cars or making construction truck noises. And because TV viewing is limited to one showing a day, it is saved for the late afternoons, when I’m prepping up a frenzy to put dinner on the table. Ah, and then there are… puzzles! The puzzle pieces lock in. An innie meets an outie. 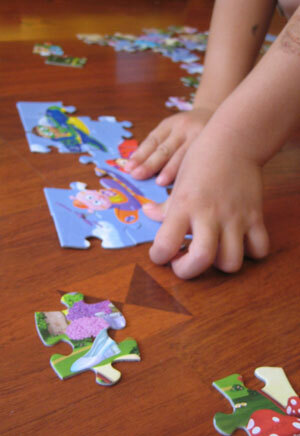 Two jigsaw parts fit together and a little bit of mystery transforms into a recognizable fragment of the picture. Watching my son hover over the pieces in quiet concentration, taking turns trying out different pieces, I can’t help but see myself in the same position as a child of faith. Heavenly Daddy, this puzzle is too hard. I can’t figure out what piece goes where. Puzzles take time, Bonnie. Be patient. Oh, good! I think I’ve got it. Is this what you want me to do? Well, maybe. For now, at least. But, the puzzle’s not done yet. You’re just working on the corners. Keep going. Wait a minute! I thought I saw the piece that had some green and grey in it. Where did it go? Why don’t you clean up around where you’re sitting. There’s too much clutter around you and it’s distracting. I give up! It’s no use! Just like I do when TJ teeters on the edge of giving up and drowning in Woe-Is-Me discouragement, God reaches His hand under dusty hiding places and swoops down next to me. Gee, thanks, God! Mesmerized, I return to the task at hand. This puzzle analogy breaks down at some point though, because in God’s plan for us, we don’t get to see the finished picture. We actually don’t have any idea what this puzzle God has for us looks like. Sometimes the parts of the puzzle we’re working on might seem boring, filling in shades of blue for the sky or brown for the mountains. Still important for a beautiful picture, though, don’t you think? Other times, it’s exciting when we find a brick to pave a path or a knob to open a door. But only God knows the whole picture. He is also experienced enough with putting puzzles together to remind us: it’s just no use forcing pieces together that almost, but don’t quite fit. 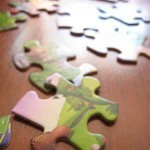 Ultimately, we have to trust God for all the pieces. We might think the answers to our problems or the gnawing “why” questions will never be answered. God may just surprise us by turning a moment in our lives around just enough for us to understand how things work out for good. But the truth of the matter is that there are difficult parts to our lives we won’t ever understand until we finally get to heaven. There, when we’re back home, God will finish the picture for us. We will no longer be staring at a puzzle. We will look into the picture and find that we’ll see something amazingly beautiful. I think we will see Jesus. 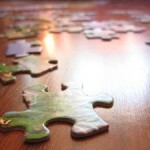 What part of your faith puzzle are you working on currently? 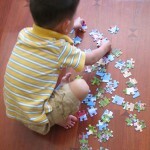 How has God handed you a missing piece? Care to share how God turned a moment around in a way that helped you see how things came together for good? How is God asking you to trust Him in the bigger picture of faith? To read more from Bonnie Gray, visit her at Faith Barista and follow her on the twitter at @TheBonnieGray.